Written by: John McGreevey and Jerry Devine. Story by: Jerry Devine. Directed by: William D. Russell. And now we come to the episode that made such a big impression on me when I was little. It begins with Uncle Bill awakening and bellowing for French. Judging from the speed at which French responds, he has apparently been lurking right outside Bill’s door with orange juice and the newspaper. Bill thinks he’s late for work, until French reminds him that it’s Saturday. Bill fantasizes about spending the whole day relaxing in bed–it has apparently slipped his mind that he’s a parent now. Not to worry: The kids are quick to remind him. 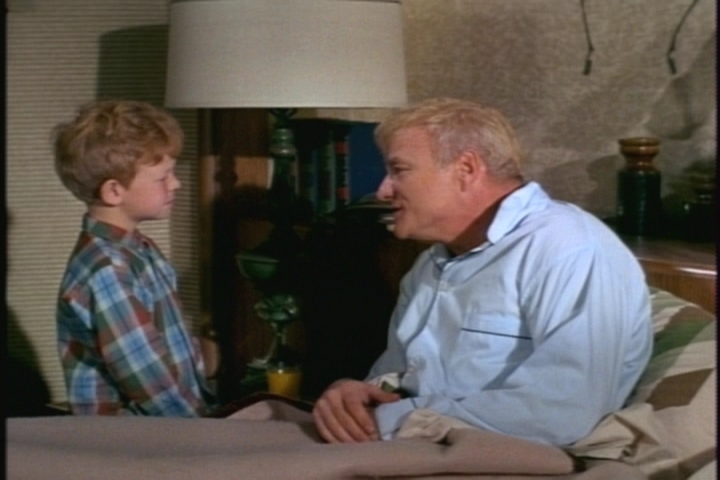 First, Jody barges in and tells him about a problem he’s having with his two best friends, Pete and Herbert. I’m just glad to hear that Jody has friends. Although, come to think of it, we never actually see Pete and Herbert in this episode. 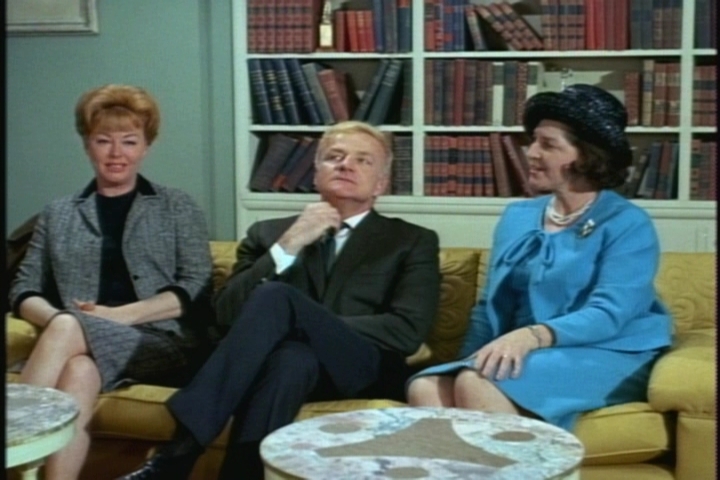 Cissy enters and chastises Jody for bothering Uncle Bill–then she proceeds to tell her uncle about her own dilemma. You see, Cissy wants to be a hospital volunteer–a “candy striper.” But she’s a few months shy of the minimum age–16–so she needs Uncle Bill to intercede for her. He agrees, even though it means giving up his Saturday morning to meet with the hospital administrator. Well, at least he has his afternoon free. Bill agrees to take Buffy to Brownie meeting that afternoon. When Cissy reports for duty, the nurse in charge stresses one rule–don’t give patients food or drink without permission from a doctor or nurse. Do you hear that, Cissy?! Meanwhile, Uncle Bill takes Buffy to meet her prospective Brownie leader. Oh, dear lord. If leaders had to wear uniforms like that today, one particular troop in my town would be short at least one leader. Although Bill hopes to make a quick exit, the leader encourages him to stay for the meeting. He’s not at all uncomfortable in that environment. 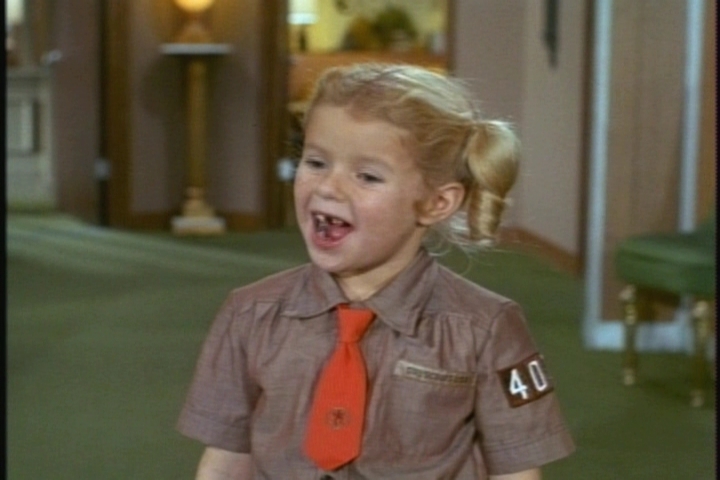 Unlike her uncle, Buffy has a great time at the meeting, and it’s clear that she can’t wait to join the troop. 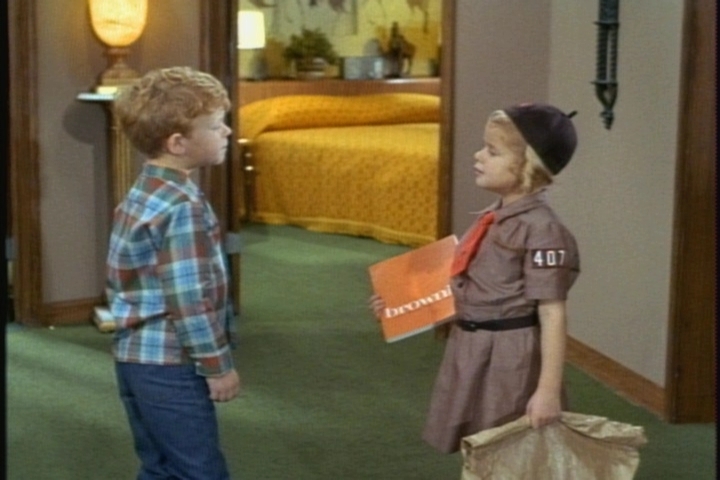 Soon Buffy is sporting her own uniform, carrying her (authentic) Brownie manual, and practicing the pledge. Jody is not impressed. He says he’d rather be a Marine…or a Cub Scout. 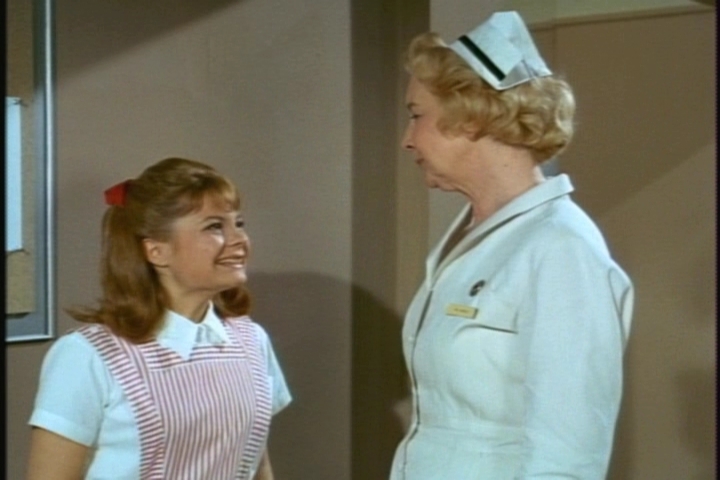 Jody has bigger problems when Cissy returns from her first day as a candy-striper: She’s so taken with the idea of nursing that she takes one sneeze from Jody as cause for alarm. During her next session at the hospital, Cissy faces a more serious test. This pitiful sounding old woman begs Cissy for a glass of water–and a sympathetic Cissy hurries off to get one. Fortunately, the head nurse catches her before she gives the patient any water. She can’t have any because she’s awaiting surgery, the nurse explains to Cissy. Giving her water would have forced the doctor to delay the procedure–a delay that could have had serious consequences. 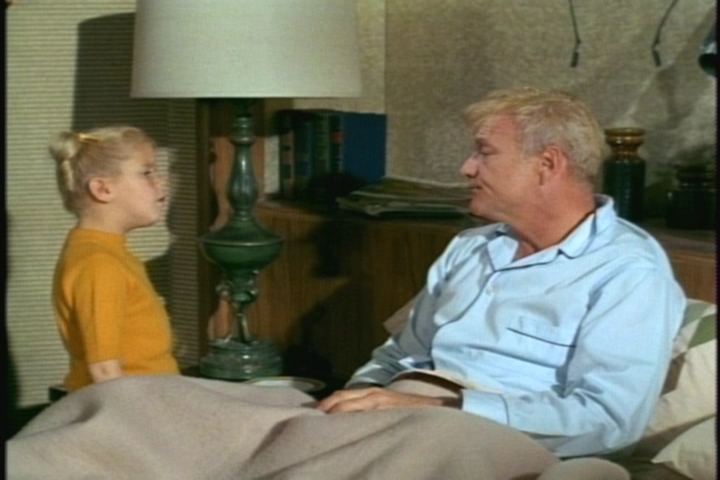 Cissy feels awful, of course, and a pep talk from Uncle Bill about moving on after mistakes only comforts her a little. The next day, she figures her career in stripes is over when her name is missing from duty roster. 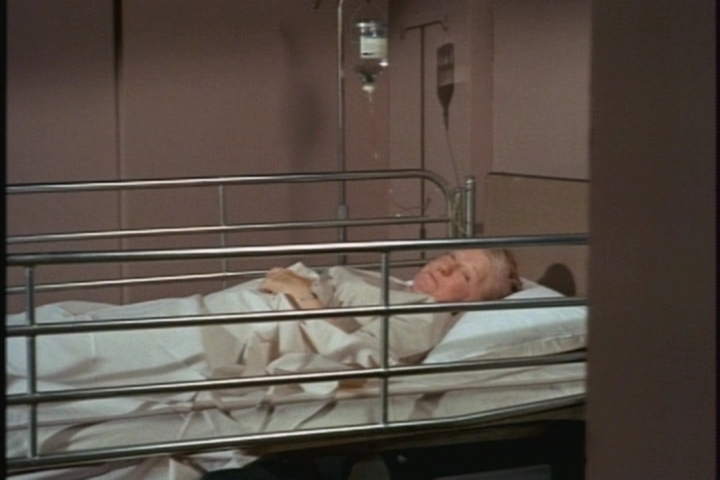 She’s thrilled when the head nurse tells her that she’s merely been transferred to another floor–the maternity ward. She redeems herself by comforting a woman who’s laboring all alone. Her husband is in the Army, the mother-to-be tells Cissy. Oh, sure. That’s what they all say. My bad–she really does have a husband in the Army, who shows up after the birth. Isn’t that an odd nursery set-up, with the babies in one big bed? Cissy returns home high on nursing again and thrilled to have played a small part in the miracle of birth. She becomes a official Brownie at a meeting in Central Park. When Uncle Bill casually mentions Buffy’s age to the leader, however, things take an unfortunate turn. Buffy is only 6, and the leader says that Brownies must be 7–no exceptions. That night, Uncle Bill has to break the news to Buffy that her Brownie career is suspended until she celebrates her next birthday. Though sad at first, she soon perks up–after all, she notes, she only has to wait 92 days. This is the episode I remembered best from my childhood. At the time, I found the scene with the old woman and Cissy’s subsequent reprimand harrowing. Oddly, I had totally forgotten about the Buffy story, which now seems more moving and which was about a child much closer to my age. 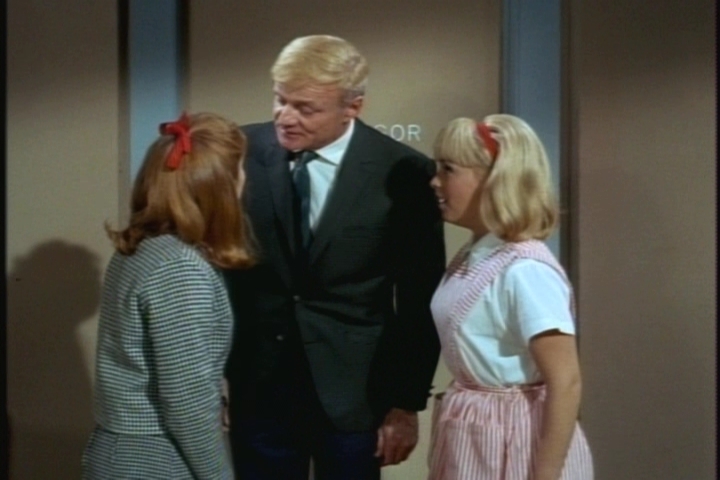 I’m sure it was this episode that made me want to be a candy striper as a teen–and I did, sort of. Volunteers at our hospital didn’t wear candy-striped dresses, darn it. Just ugly burgundy smocks. 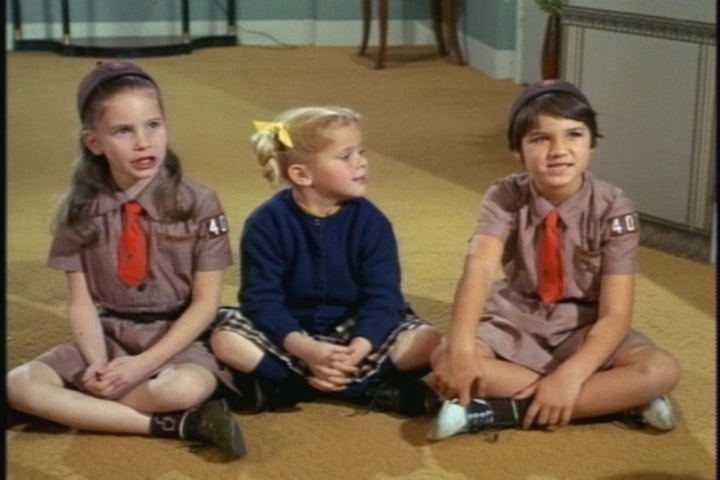 Scouting-themed episodes are common on sitcoms aimed at kids–even several of the current Disney Channel shows have done such episodes. The scouts in these episodes, though, always represent some made-up organization, like the Frontier Boys or the Sunflower Girls. 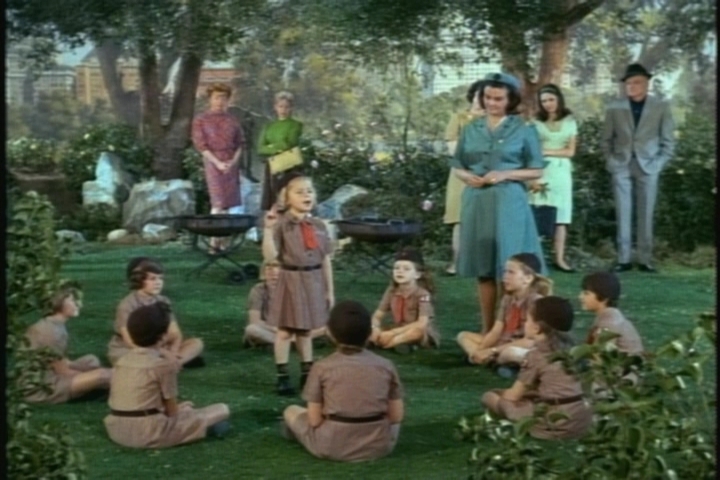 I can’t think of any other show besides Family Affair that featured real Girl Scouts or Boy Scouts. I’m curious about how that happened–did the Buffy character’s great popularity with young girls convince the Girl Scouts of America to use the show as a recruiting vehicle? It’s pretty obvious that they got some “technical advice” from the Scouts, since the portrayal was so authentic. (Even the badges Buffy is holding in the featured image atop this page are recognizably real.) The only thing I question is the age rule–membership goes by grade level now, and I’m pretty sure it did in my day, too. Otherwise, girls would be changing levels chaotically throughout the school year as they celebrated birthdays. Mrs. Russell: Alice Frost. Sharon: Sherry Alberoni. Mrs. Warren: Karen Green. Mrs. Elkins: Nydia Westman. Randy: Debi Storm. Mrs. Thompson: Audrey Dalton. Dalton made many guest appearances on TV westerns. Her film credits include 1953’s Titanic. Debi Storm made a memorable Brady Bunch appearance–she was Molly Webber, the girl Marcia made over. 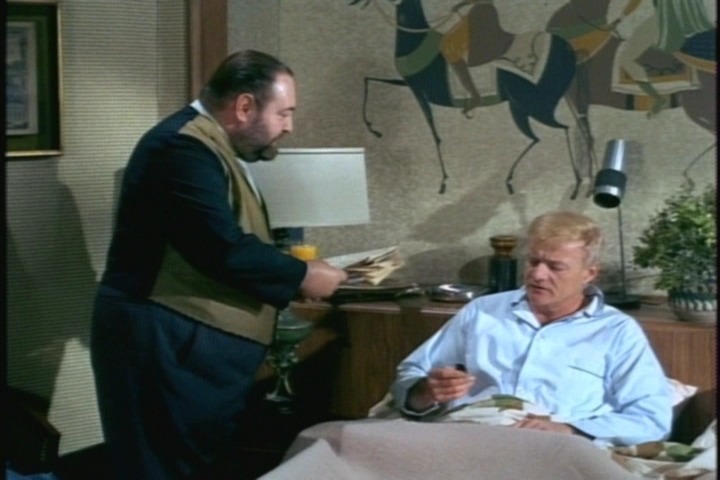 This entry was posted in Family Affair, Television and tagged 1960s, Anissa Jones, Brian Keith, Candy Striper, Classic Television, Family Affair, Girl Scouts, Johnnie Whitaker, Johnny Whitaker, Kathy Garver, Nostalgia, Sebastian Cabot, Sherry Alberoni, Television. This looks like a particularly good episode. It’s funny when you realize that a certain show aired on the day you were born. 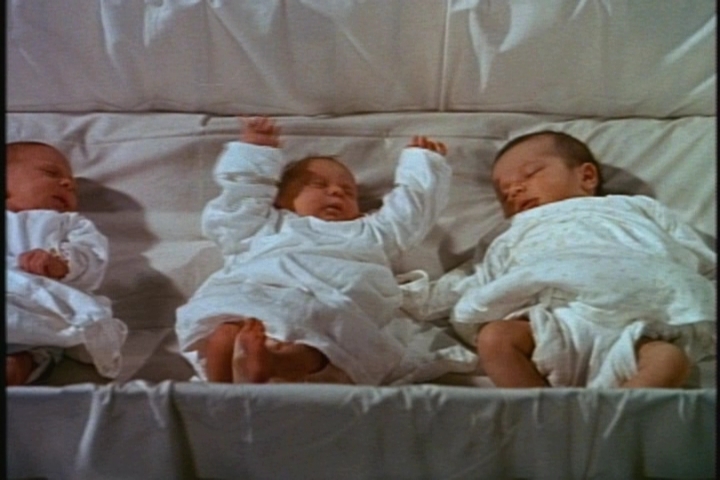 I recently realized that the My Three Sons episode with the triplets’ birth coincided with my own birth. 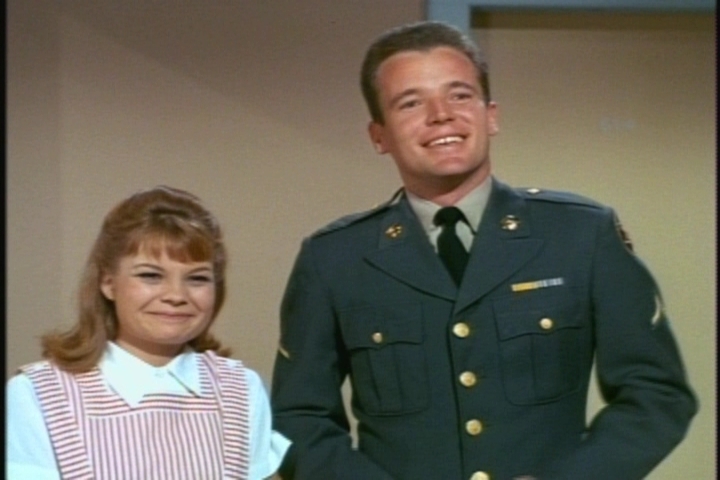 Oooh, you were lucky to get the real candy striper uniform. I wonder why uniforms have fallen out of fashion with kids over the years. Girl Scouts today only wear sashes or vests. I absolutely loved going to the one department store in town that sold Scout uniforms and buying all my items.